All those who joined Team Tolstoy on dovegreyreader.typepad.com will be at Troika Stop One today, enjoying Lynne’s post which, quite rightly, focuses on the characters. Tolstoy is the master of character. I’ve read W&P twice before and, I think, each time I’ve been on the final draft of a novel. It’s a wonderful companion at that stage. As you write and edit and feel the temptation to let something pass, Tolstoy whispers to you, tune it up, tune it up, you can do better. Yes, he’s a little old fashioned in the leisure he affords himself to paint a scene and the characters in it. Take the death of Count Bezuhov. You learn exactly where everyone is standing: which side of the door, underneath the icons, by the invalid chair, etc. We know what they wear, how they look, their expressions. Modernism demands a sleeker, less cluttered narrative. As in the theatre, where the stage used to be fully-propped to convince us that the story is real, these days the scenery is merely implied. But there is still so much to learn from the old master. I read and re-read the death of Bezuhov while I was writing about the death of Lorenzo il Magnifico in The Rebirth of Venus. I didn’t come anywhere close, but without doubt I improved on the previous drafts. The ‘culture of aspiration’ works as well in writing as it does in society. If we can see the peaks of mountains, we go up higher than if we can’t. First, take your time and be there. Close your eyes and imagine the scene. Visualise the surroundings – see them, hear them, feel them, taste them. Then see – and hear – your people. Stuck now? Then go out and get some models. War and Peace, about the 1812 war, is set sixty years earlier than the time of writing. Therefore Tolstoy made the characters up, but I have no doubt – do you? – that he was basing them, at least archetypally, on people around him. ‘One of them was a sallow, clean-shaven civilian with a thin, wrinkled face, already advanced in years though dressed like a young man in the height of fashion. He sat with his legs up on the ottomon as though he were at home, and having stuck the amber stem of his pipe far into the side of his mouth was spasmodically inhaling smoke and screwing up his eyes. 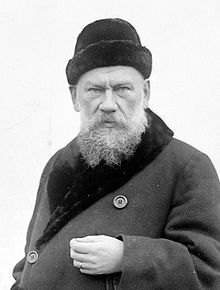 This was an old bachelor, Shinshin, a cousin of the countess, famed in Moscow drawing-rooms for his biting tongue.’ How many boring salon visits did Tolstoy endure by mentally taking note of what was said, and how it was said, and who by? An aristocrat himself, he stands outside his circle like Pierre; unlike Pierre, he notices everything with a kestrel’s keen eye. And he’s not averse to putting in the beak when opportunity arises. I love that scene where the Rostovs are having an open house to celebrate Natasha’s name day, and the countess never speaks to anyone about anything other than herself. She’s the sort of person whose head I would like to hold under water until her hair dye runs and her curls fall out. And when the last long-suffering visitor finally leaves, what does she say? ‘What manners! I thought they were never going.’ [chap 9]. That form of snobbery is still with us today and is probably eternal. That’s Tolstoy’s art: to find, identify and express those traits which we are all familiar with, in ourselves and in others. It makes W&P a deeply psychological novel and explains its enduring popularity. 1. Go through the first twenty five chapters and copy out or highlight everything that is said about Pierre who, as I’m sure we’re all finding, is something of a dolt. How do we know that? What words did Tolstoy use to make us form that opinion? 2. In whatever you’re writing, take one character and find someone you know who is similar, who may even have been the source of your inspiration. Now write a pen portrait of that person. Don’t worry about sentences: brainstorm words and phrases. Note the exterior and the interior – the legs up on the ottomon and the biting tongue. With thanks to Wikipedia Commons for the photo, and the excellent article on War and Peace.